The delightful little church of All Saints stands within the grounds of historic Kedleston Hall, home of the Curzon family. 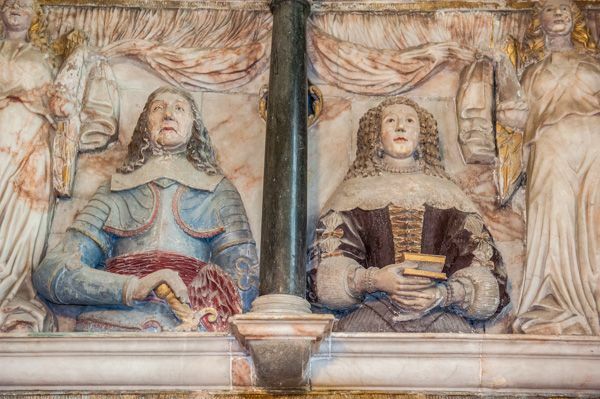 Monuments to generations of Curzons, dating back over 700 years, fill the church. 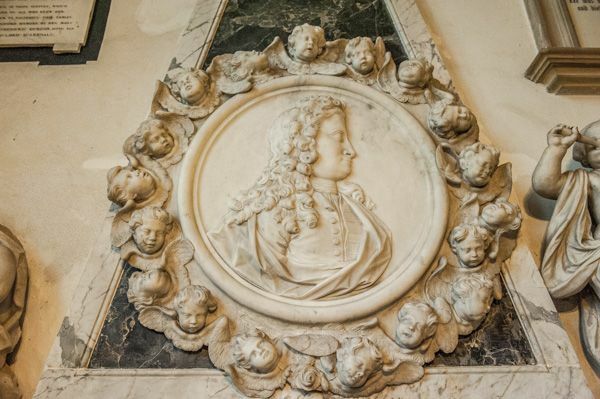 It is staggering to see so many centuries of memorials in one place and realize that the Curzons have been linked to Kedleston for 7 centuries. 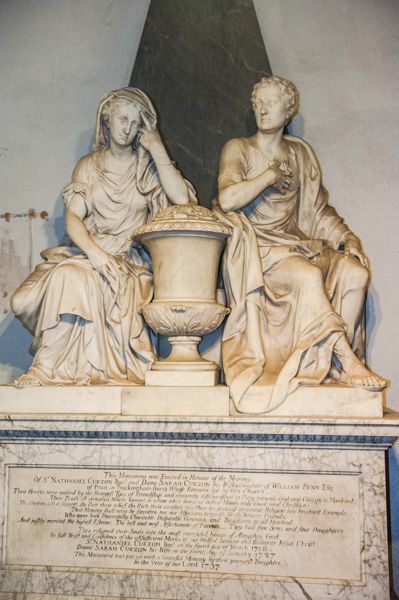 The range of monuments is simply amazing, ranging from medieval effigies to ornate neo-classical tombs by Robert Adam. 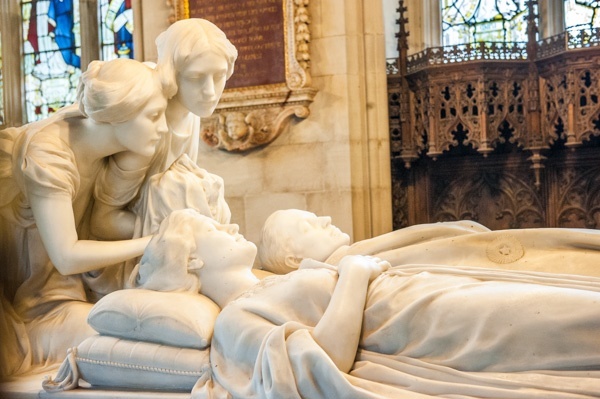 There are 35 Curzon tombs in all, but the most impressive is the striking white marble monument to Mary, wife of Lord Curzon of India, which was designed by GF Bodley in 1906. Bodley's delicious design used stained glass windows situated to focus coloured light on the tomb and reflect off a floor of glittering green quartz. The earliest Curzon memorial is that of Sir Thomas de Curzon, who died in 1245. 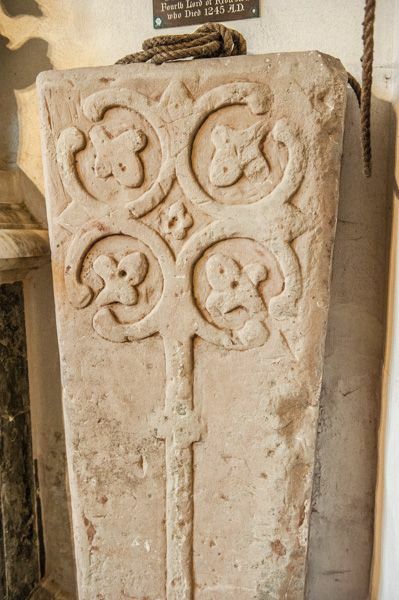 This is a simple grave slab decorated with a floriated cross. 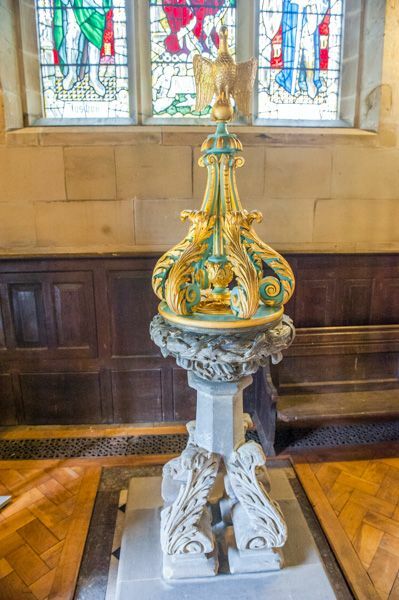 It was discovered elsewhere in the church and relocated to the south transept. 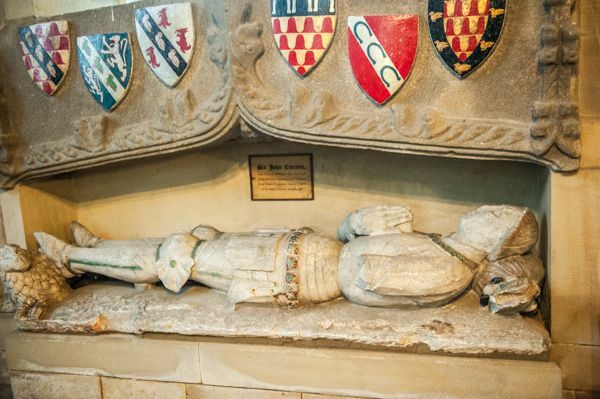 The 15th-century tomb of Sir John Curzon and Lady Joan, his wife, is worth special mention. 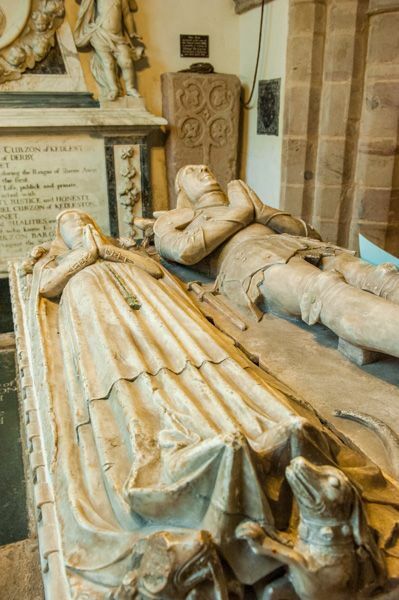 This wonderfully carved tomb displays effigies of the couple with beautifully detailed late medieval costumes. At the head of the tomb are carvings of their 17 children, kneeling in a pose of mourning. 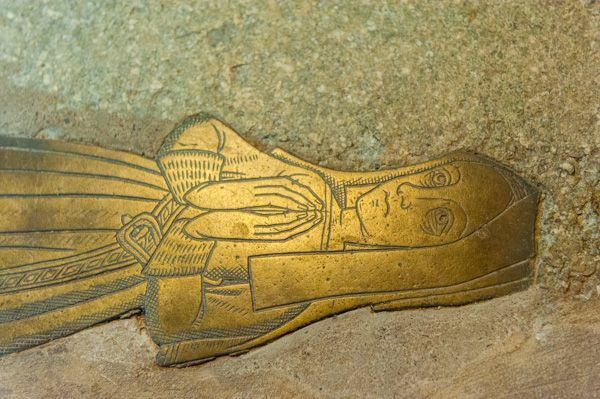 In the chancel floor is a late 15th century brass to Richard Curzon and his wife Alice, while nearby are two fascinating carved heads protected by wooden coverings. As impressive as the monuments are, the most interesting feature of the church for an antiquarian will undoubtedly be the Norman south doorway, which is beautifully carved with traditional Norman symbols including zigzag patterns and beak heads. Above the door is a tympanum with further carvings of a man on horseback and wild animals. The wall surrounding the door is also of Norman construction, and together they form the oldest part of the current building. One unusual feature is that this little church is built to a cruciform plan, something not usually seen outside larger churches, generally those located in towns. The tower is located over the crossing of nave and transepts. The manor of Kedleston was mentioned in the Domesday Book, but the first known reference to a church was in 1198. At that time it was known as St Margaret's. The dedication to All Saints came about as a mistake; in 1742 a book mistakenly referred to the church as All Saints, and the designation stuck. Despite the Norman features, the bulk of the church is 13th century, though there are also some very nice Georgian bits and bobs, including high box pews, a carved pulpit, and communion rails. One Georgian touch can be found at the east gable on the exterior, where a sundial is the centrepiece of a quite dreadful pun (or, maybe it is a great pun, depending on your sense of humour!). The sundial is surrounded by hourglasses, indicating the inexorable passage of time, and by skulls and crossed bones, indicating the eventual end that awaits us all. Here is written 'Wee shall', to which the reader is meant to supply the rest of the phrase 'soon die all' ('sundial'). Ouch! The church is no longer in use for regular worship, and since 1988 has been in the care of the Churches Conservation Trust. Do take time to combine a visit to Kedleston Hall with this delightful and historic church.